Xinwei Wang had a hunch that spider webs were worth a much closer look. 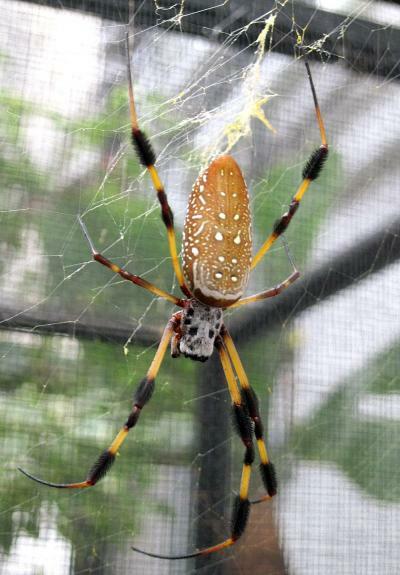 So he ordered eight spiders -- Nephila clavipes, golden silk orbweavers -- and put them to work eating crickets and spinning webs in the cages he set up in an Iowa State University greenhouse. 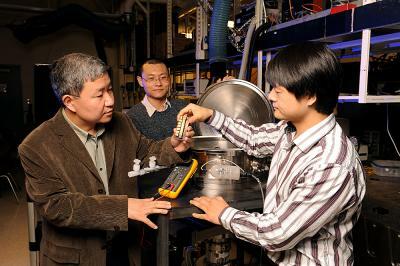 What Wang and his research team found was that spider silks -- particularly the draglines that anchor webs in place -- conduct heat better than most materials, including very good conductors such as silicon, aluminum and pure iron. Spider silk also conducts heat 1,000 times better than woven silkworm silk and 800 times better than other organic tissues. A paper about the discovery -- "New Secrets of Spider Silk: Exceptionally High Thermal Conductivity and its Abnormal Change under Stretching" -- has just been published online by the journal Advanced Materials. The paper reports that using laboratory techniques developed by Wang -- "this takes time and patience" -- spider silk conducts heat at the rate of 416 watts per meter Kelvin. Copper measures 401. And skin tissues measure .6. "This is very surprising because spider silk is organic material," Wang said. "For organic material, this is the highest ever. There are only a few materials higher -- silver and diamond."